Wrapping up at Flushing Creek. As described in prior posts, one found his way down onto the sand at Flushing Creek, which was a fairly intriguing spot. I’ve already made inquiries with one of my paddler buddies about who I have to talk to in order to get on the water in a rowboat or something back here, so stay tuned as the weather gets warmer and the plants start turning green again. As also mentioned, I’m trying to stay a bit ignorant about conditions and history back here for the moment, but at first flush there are a very different set of environmental issues hereabouts when compared with my beloved Newtown Creek. 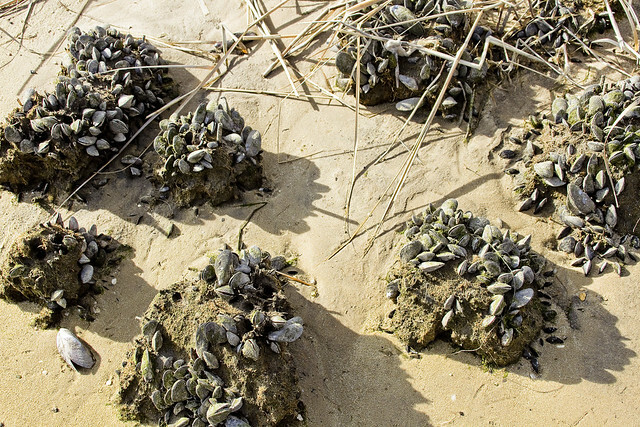 Everywhere I looked, there were shellfish clinging to this and that all along the intertidal or littoral zone. My ignorance is willful, as I just want to wander around and take pictures. Of course, I’m entirely ignorant… about… kinds… of… shellfish… speciation… of… No! A lot of the talk centering around the Superfund Rememdiation process on my beloved Creek has discussed the creation of wetland habitat not dissimilar to what’s pictured above. Hopefully, the illegal dumping and wind blown trash won’t be part of the final equation in Long Island City or Greenpoint. I wonder how long that truss bridge is… how high… average daily traffic… about who built… NO! My ignorance will not be pierced… I refuse! Personally speaking, it was actually quite a bit of fun for a humble narrator to see new things, given how much time I devote to chronicling the western end of the Newtown Pentacle. Yes, Flushing has always been on my map, but there’s always been something else to do which is closer to home. Akkk… is that the Van Wyck… Grand Central… something that ends in a “78”… IGNORANCE! My pal Val and I left the beach and proceeded up onto the Northern Blvd. truss bridge leading to downtown Flushing and what, by this point, would be a well deserved and very affordable luncheon meal at a Chinese restaurant in the downtown area. Even on a weekday winter afternoon, throngs of shoppers were marching about, and the streets of downtown Flushing were quite crowded. The neighborhood BIDS and the Chambers of Commerce of Western Queens could learn a thing or two at the end of the 7 Line, I think. Managers and promoters of dying or moribund commercial strips like Steinway Street – for instance – should study Roosevelt Avenue, and Prince or Main Street. In terms of street level retail activity and abundant small businesses, Flushing is popping. What do I know? I’m largely ignorant. Down by the water though, it’s the usual story. Government owned shorelines with fenced off industrial facilities, too few businesses taking advantage of those precious maritime bulkheads. Has to be all kinds of yuck in the water… Flushing Creek itself is situated at a locus of high speed roads, the 7 line… Arrggggghhhh… I almost just looked up Flushing Creek… NO! Back tomorrow with something completely different at this, your Newtown Pentacle. On the sand at Flushing Creek. After having successfully navigated my way to the water’s edge at Flushing Creek through an open gate, a humble narrator (and my pal Val, who was game for this particular caper) proceeded off the concrete and down onto the sand. 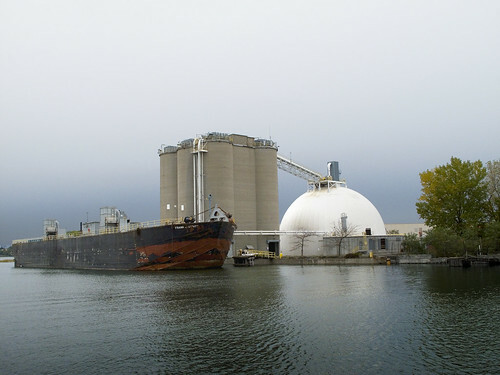 As mentioned previously, I’m intentionally staying dumb about the Flushing Creek waterway – for now – as it’s entirely novel to me to “know” nothing about something and I want to preserve that as long as possible. It’s philosophic with me, ignorance, and it’s difficult to preserve. Every year, I play my “Super Bowl Challenge,” which is prophylactic in terms of information regarding the big game. I don’t want to know when, where, who… anything. It’s more difficult to know nothing than everything about something these days. A challenge I’m several years into, as a note, is the Lady Gaga challenge. I know nothing about Lady Gaga other than her name. Never looked at a photo, listened to a song, wouldn’t recognize her if she was sitting next to me. No animosity against the house of Gaga is offered, of course, it’s just extremely challenging to remain completely ignorant of somebody is who apparently a huge pop star – and it’s a challenge I accept. I guess I know she’s a pop star. 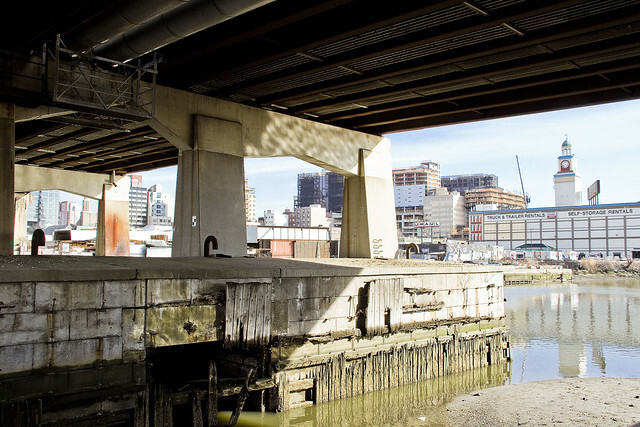 By my standards, which are set to a high bar by that legendary exemplar of urban neglect which is the Newtown Creek, things didn’t look too bad around here. 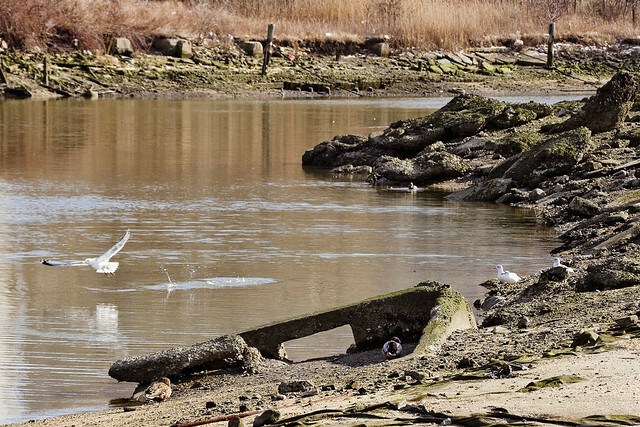 There were all sorts of garbage, dumping, broken pipes like the one above encountered… but… I mean… Maspeth Creek… y’know? Part of the reason I wanted to come here during the brown and brittle months of the winter, incidentally, involved the lessened chances of encountering biting insects and ticks in particular. Got to imagine that there are clouds of mosquitos and black flies around this spot during the summer months. 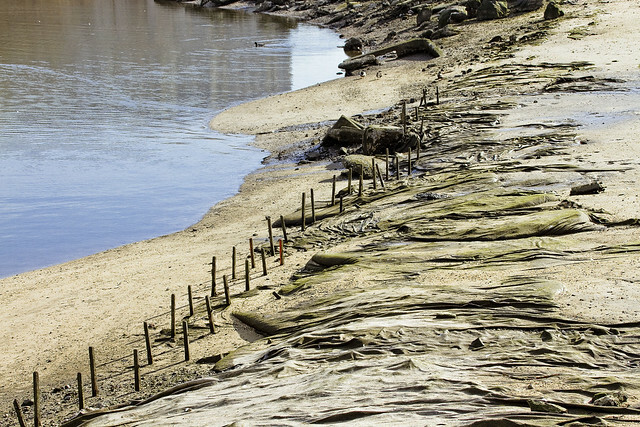 There was some sort of ruggose canvas placed on the shoreline, no doubt an attempt at fighting erosion of the sandy beach. The good news is that said canvas created a hard pack surface which was easy to walk on. We were visiting Flushing Creek at the low tide interval of the daily cycle, so lots and lots of shoreline was revealed. Modern day Flushing, with its massive “Hong Kong” style real estate developments, provided a backdrop for the scene. Like LIC, this “other” end of the 7 line in Queens has been growing exponentially in recent years. Manhattan’s Chinatown has been relegated to history’s dustbin, a relic of a forgotten age in NYC. Flushing is where it’s at these days, as far as where Chinese people live and work, and the place is being remodeled according to their tastes and preferences. The “American Way” at work. We proceeded back along Flushing Creek for a bit, and the further that we went in the direction of Roosevelt Avenue, the more marshy the ground became. Brush and grasses became thicker, and salt water streams punctuated the foliage with increasing frequency. The sound of traffic on the nearby highways and area streets were the only non naturally generated sounds, other than the occasional passage of a 7 Line train set on the overhead trackage which carries the subway to and from Flushing’s Main Street. There were oodles and oodles of birds flapping around, and I’m sure that at night this part of Flushing Creek would be crawling with Raccons and Rats and all sorts of nocturnal critters doing their thing. More tomorrow, at this – your Newtown Pentacle. That’s the mouth of a waterway, or so I’m told, which is called Flushing Creek. As a note, I’m not going to be going all “history boy” on Flushing for a bit. The reasoning behind that particular statement involves not wanting to kill the fun of discovery for me, as I’m willfully coming at this waterway “cold.” Haven’t read up on it, talked to the locals in any sort of detailed fashion, pored through dusty old books, or even hit the Wikipedia page for it. This stance is assumed in the name of not having any preconceptions regarding the place, and is an attempt to preserve some sort of joy before getting all “heavy” with the researched facts and details that I inevitably will get curious enough to learn. At the moment, I’m rolling on “vibe.” Like most of the water found on the forbidden northern coast of Queens, Flushing Creek requires you to display some level of “intent” to consciously reach it. There’s a point of pedestrian access, however, which I stumbled across. Passing through an open gate under the Northern Blvd. bridge, there’s a well worn footpath which allows some access to the sandy beach and grassy marsh shoreline. 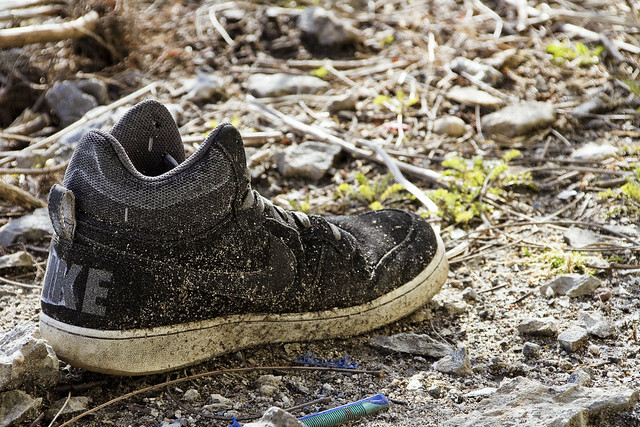 The first thing encountered down there, between the highways and overpasses, was a singular shoe. It would seem that the Queens Cobbler has also felt a bit of wanderlust during the winter months of 2019, and got here first. Previous conversations with (the few) people I know that live in Flushing indicate that there is zero access to the shorelines, which is something that I can now report isn’t true. Zero “official” access is more accurate. 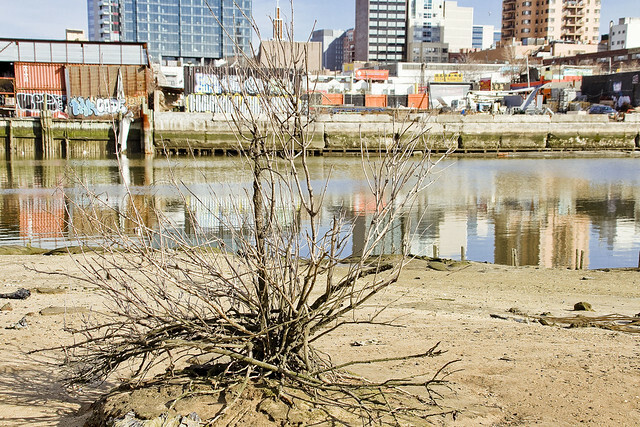 This is the shoreline found alongside the Van Wyck and its off ramps, and between Northern Blvd. and Roosevelt Avenue. As mentioned above, there was a pretty well worn footpath down here. There was also evidence of habitation at various points along the footpath, including a shredded hammock and other bedding. Under the highway ramps, there were coolers and other indications that somebody was living down here. I did spot some fellow sleeping one off with his back up against the highway retaining wall, but I got the sense that he was just enjoying an afternoon siesta. I’ve been told about insalubrious gatherings occurring down here which I definitely don’t want to be a part of, but that’s just rumor for me at this particular moment so… pfahh. Having switched my camera over from “long exposure” to “hand held” night settings and lenses, the Northern Blvd. truss bridge carried an official part of the Flushing Bay Promenade which led back to residential Flushing. The next time that I come back here, and I’m planning on it, I’m going to setup the tripod and long exposure kit up here and see what happens. The walkway is shared with a bike path, so I’ll have to take care not to present too big a footprint and ensure that I’m “visible” to oncoming bikes. You can talk till you’re blue in the face to the bicycle fanatics, but they’ll never acknowledge that bicycles are vehicles. Why they love to infringe vehicle infrastructure onto pedestrian area pavement is beyond me. They also insist that they shouldn’t “have” to wear bike helmets. I insist that you shouldn’t have to wear shoes, but you’re walking around NYC, so it’s probably a good idea. Doesn’t matter, they’re not from here, and will move away when the decade long real estate bubble bursts to start trouble somewhere else. 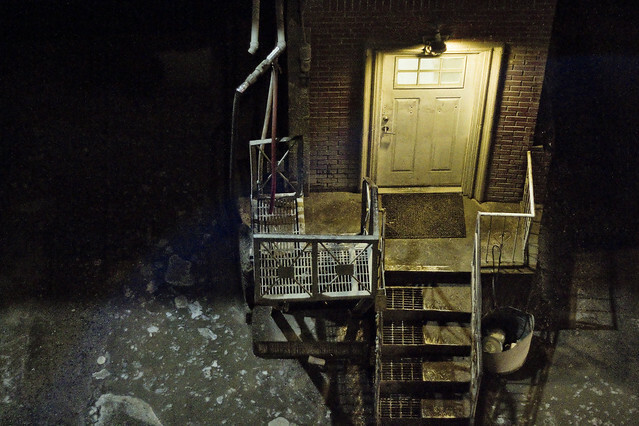 The shots in today’s post are high ISO and wide aperture ones, which report something fairly close to what the scene looked like to the naked eye. Dark, essentially. This jibes with what I’m always told by people who spend their time – or grew up – in this section of Queens around Flushing Creek. It’s hidden, largely inaccessible and locked away behind chain link fences, something that is experienced from a distance. 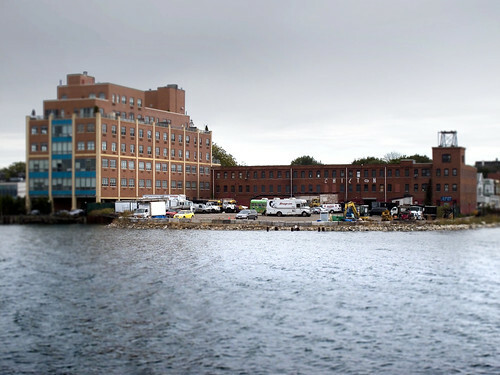 Sounds a lot like my beloved Newtown Creek, huh? This section around Northern Blvd. 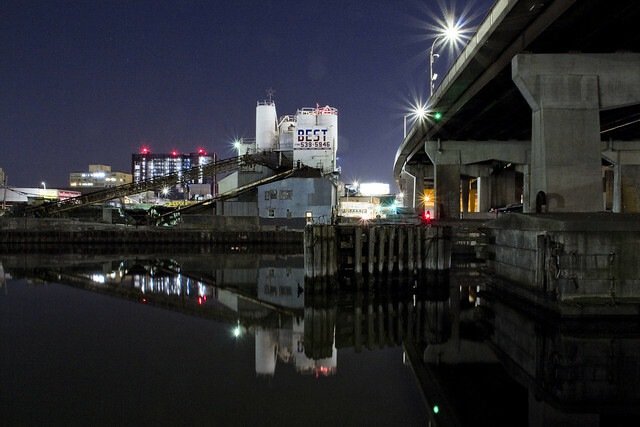 actually reminded me a lot of Industrial Maspeth, or Dutch Kills in LIC. Next week, I’m hoping to take you to some places more familiar, as my post polar vortex schedule (this post is being written on Tuesday night, just before midnight… Hello world of the future!) 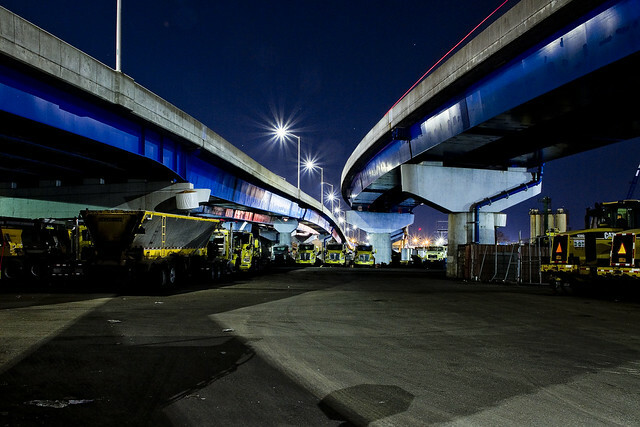 offers many diversions in Astoria and Long Island City. I’m also meaning to head into the City for a short spell and take some pictures of a thing. You never can tell where I’m going next, I sure can’t. That’s not Flushing Creek in the shot above, rather it’s part of a largish NYC DOT facility that adjoins it. 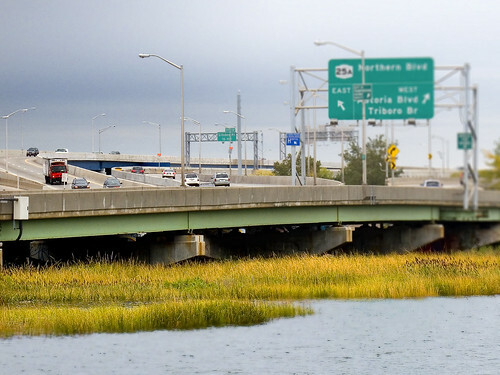 I’m fairly sure that the elevated roadway to the left is the Whitstone Expressway and that the one on the right is Interstate Highway 678, which is odd since 678 never leaves NY State and actually connects the Bronx and Queens with the Hutchinson, but there’s Robert Moses for you. There’s a tangled cloverleaf of high speed roads here – where East Elmhurst, Willets and College Points, and Flushing combine. As mentioned earlier in the week, I call this the area “where boulevards collide.” It’s all very confusing, and one of the least pedestrian friendly spots in the entire city. 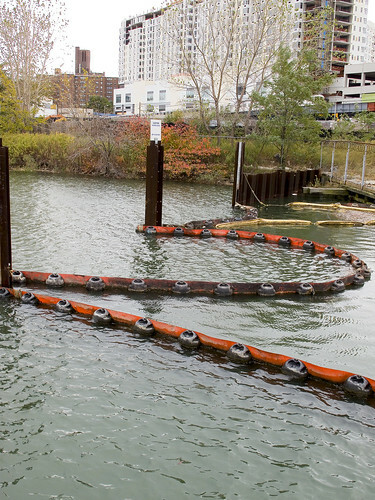 An open fence allowed access to the water at Flushing Creek, alternatively known as the Flushing River. This shot looks sort of westward along the industrialized canal. 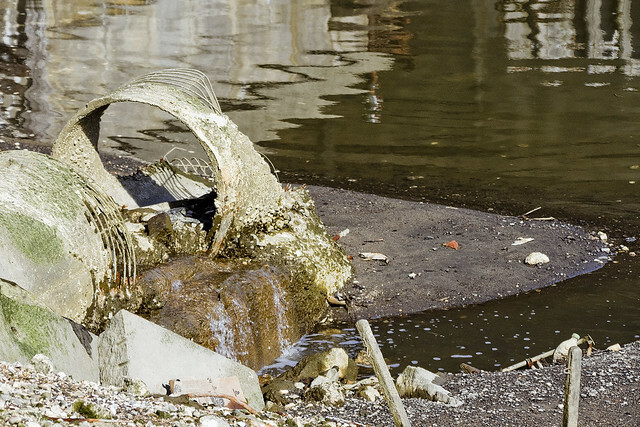 Both Flushing Bay and Creek have all the usual environmental issues – I’m told – involving open sewers and post industrial pollution that are commonly observed along NYC’s inland waterways like the Gowanus or my beloved Newtown Creek. I believe that’s Northern Blvd. up there, on the truss bridge over Flushing Creek. This shot is looking towards “Downtown Flushing” and the Main Street area. I intend to get to know this waterway quite a bit better in the coming months, as I’m always looking for something new to point my camera at, and to learn more about the Borough of Queens. A new friend, whose family could trace ancestry back to the colonial settlers of Flushing, was searching for the spot where her forebears had settled on the Flushing Creek (or river, depending on who you ask). Armed with serious historian muscle, and having hired an experienced mariner to shepherd the journey, She mentioned to a mutual colleague that there was room for one more on the ship, and proffered that He join her party. Busy with professional obligation, this colleague of ours suggested your humble narrator ride along, which is how I ended up leaving the strict borders of the Newtown Pentacle and found myself on Flushing Creek. The current site of the airport was originally used by the Gala Amusement Park, owned by the Steinway family. It was razed and transformed in 1929 into a 105-acre private flying field. The airport was originally named Glenn H. Curtiss Airport after the pioneer Long Island aviator, and later called North Beach Airport. The initiative to develop the airport for commercial flights began with a verbal outburst by New York mayor Fiorello La Guardia (in office from 1934 to 1945) upon the arrival of his TWA flight at Newark — the only commercial airport serving the New York City region at the time — as his ticket said “New York”. He demanded to be taken to New York, and ordered the plane to be flown to Brooklyn’s Floyd Bennett Field, giving an impromptu press conference to reporters along the way. At that time, he urged New Yorkers to support a new airport within their city. 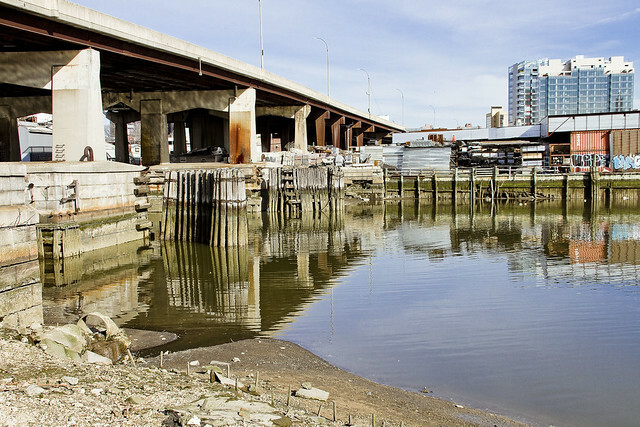 Factual inconsistencies and wild conjectural fantasies aside, one of the stated goals of this project is documentarian in nature (in the notion that someone in the future will be looking for photos of “Queens in the Past”), and the vantages of the northern Queens shoreline are largely blockaded and hidden from land. I leapt at the opportunity. The security apparatus and extensive fencing of (starting at the east river) an electrical power plant, a sewage treatment plant, prison complex, and airport enforce a cordon (and appropriately so) of the shoreline from the landward side- at least. Your humble narrator takes a lot of heat from the Urban Explorer types for the “Do Not Trespass” mantra here at Newtown Pentacle. Its my firm belief that – like a vampire- you have to be invited in before you can really do your work. The nervous thrills experienced in penetrating an abandoned factory or condemned hospital or active rail trackbed are outweighed by both the physical and legal dangers to yourself, and exhibit a real lack of empathy toward the poor bastards at NYFD who will have to figure out a safe way to rescue you. I’ve described the attention paid me by radio patrol car police officers as I squat down on the Hunters Point Avenue Bridge trying to get a picture of pollen settling into sticky waters at the Dutch Kills, and been chased for blocks by a hysterical Greek woman screaming “terrorist” at me around Ditmars. I roll under a flag of “if you can see it in a public place, you can take a picture of it, as long as you don’t imply some editorial meaning to it that wasn’t there” and “ask”. I do take a lot of pictures I don’t run, though, and often slightly obscure locations if the subject is so wildly and criminally vulnerable that I had time to set up a tripod and shoot dozens of photos. And… I never show anyone the images, of all the dead things. 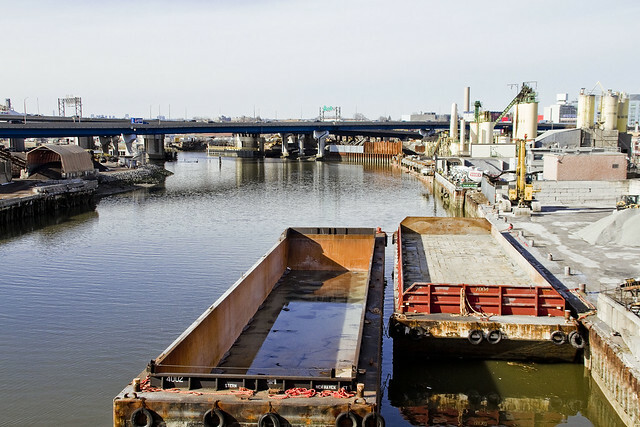 A number of Long Islanders have been quietly considering for some time the feasibility of cutting a ship canal from Newtown Creek to Flushing Bay, and have now reached the conclusion that the work should be done. 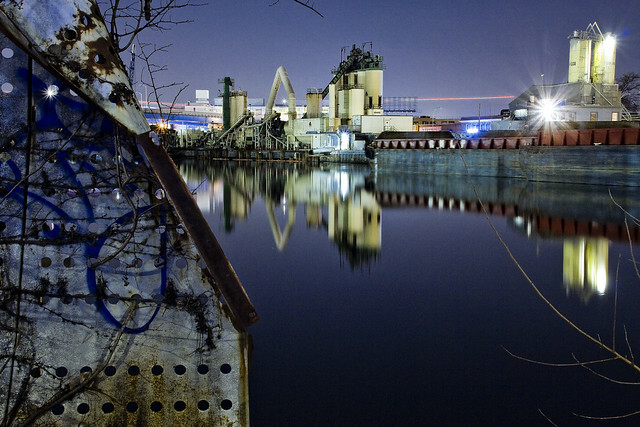 The aura of Flushing Creek, as viewed from the water, might best be described as “Dickensian”. The modern steel highways, sweeping in elegant curves over the storied waters, produce tenebrous shadows pregnant with sinister implication. What horrors may have transpired here, under sodium light, fills your humble narrator with wonder. 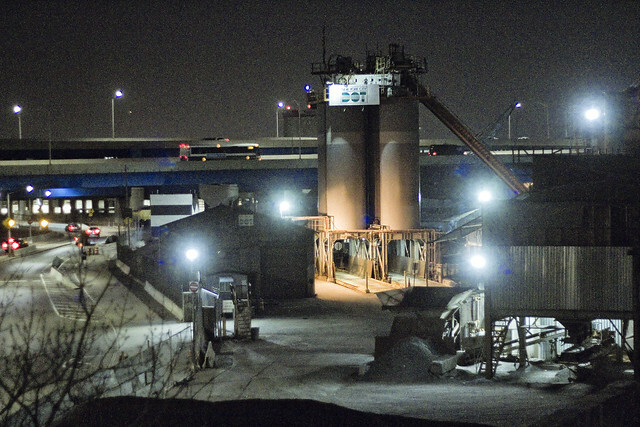 Heavy industry, like this concrete company, seems to dominate this part of Flushing Creek. It all feels somewhat atavist, yet, these are the sort of “mills” that built New York City. Flushing, named for the Dutch village of Vlissingen, was the first permanent settlement in Queens, and was founded in 1645. In 1657, the town fathers issued the “Flushing Remonstrance,” which defied Governor Peter Stuyvesant’s demand that the town expel Quakers, Jews, and other religious groups. Flushing was the first town in the Western hemisphere to guarantee religious freedom for its residents. The Flushing Railroad, which later became part of the Long Island Rail Road, opened in 1854, as urbanizing influences gradually penetrated the more rural portions of Queens. Urbanization accelerated in the early 20th century, when the Queensborough Bridge opened in 1909 and the subway system was extended to Flushing in 1928. In the 1930s, a former ash dump on the west side of the Flushing River became the site of the 1939 World’s Fair and, later, the third-largest park in New York City—Flushing Meadows Corona Park. The park hosted the 1964 World’s Fair. Built by Robert Moses to house the 1939 Worlds Fair, Flushing Meadows Corona Park cuts the Flushing Creek from its original flow. From 1946 to 1951, the United Nations General Assembly was held at the New York City Pavilion, said Pavilion is now the Queens Museum of Art. Said Museum houses the Panorama of the City of New York, and the United Nations meet in a house that Rockefeller and Le Corbusier built over in Manhattan. LeCorbusier is responsible- ideologically and in some cases literally- for the ring of poverty surrounding Paris, the council housing of London, the housing complexes of Chicago, and of course- New York’s rather disastrous experience with “the projects”. He was the Ayn Rand of architecture. Theoretical urban schemes continued to occupy Le Corbusier. He exhibited his Plan Voisin, sponsored by another famous automobile manufacturer, in 1925. In it, he proposed to bulldoze most of central Paris, north of the Seine, and replace it with his sixty-story cruciform towers from the Contemporary City, placed in an orthogonal street grid and park-like green space. His scheme was met with only criticism and scorn from French politicians and industrialists, although they were favourable to the ideas of Taylorism and Fordism underlying Le Corbusier designs. Nonetheless, it did provoke discussion concerning how to deal with the cramped, dirty conditions that enveloped much of the city. Le Corbusier moved increasingly to the far right of French politics in the 1930s. He associated with Georges Valois and Hubert Lagardelle and briefly edited the syndicalist journal Prélude. In 1934, he lectured on architecture in Rome by invitation of Benito Mussolini. He sought out a position in urban planning in the Vichy regime and received an appointment on a committee studying urbanism. He drew up plans for the redesign of Algiers in which he criticised the perceived differences in living standards between Europeans and Africans in the city, describing a situation in which “the ‘civilised’ live like rats in holes” yet “the ‘barbarians’ live in solitude, in well-being.” These and plans for the redesign of other cities were ultimately ignored. After this defeat, Le Corbusier largely eschewed politics. The land that the complex sits on was purchased from William Zeckendorf (a mid 20th century real estate baron) in a deal brokered by the Chase Manhattan Bank. Chase, of course, was the instrument of future New York Governor and United States Vice President Nelson Rockefeller. Grandson of John D. Rockefeller, and inheritor (with his brothers) of the Standard Oil fortune. The Rockefellers had already offered some of their own land-the house that Standard Oil built- and Rockefeller family castle,in Westchester, for use as the potential seat of a world government- but it was “too far away” for the diplomats. So, he had his father- John D. Rockefeller Jr. buy Turtle Bay and donate the land to the city for the UN. The area called Turtle Bay was where the Draft Riots of 1863 started, and it was a neighborhood of tenements, butchers, slaughterhouses, and dangerous organized crime controlled docks which handled the traffic coming to and from Long Island City via rail and barge. 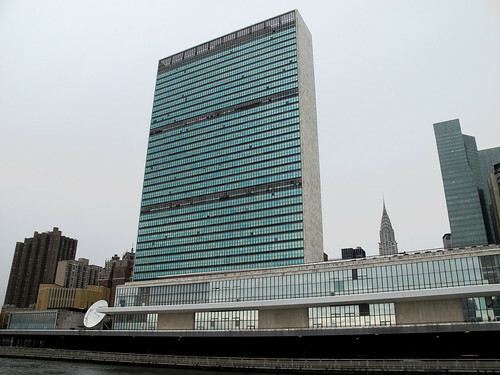 The United Nations building was completed in 1950. 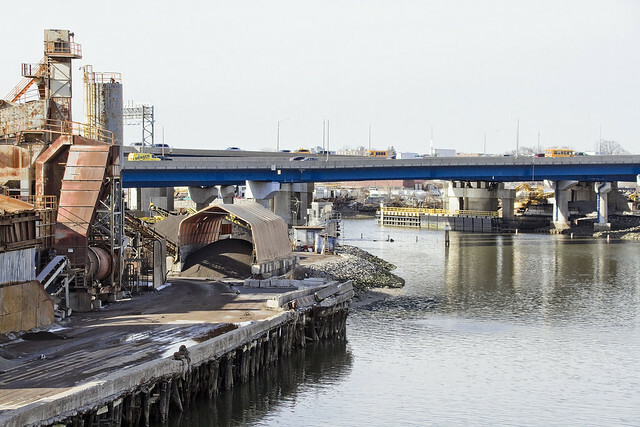 1950 is also when the decline of the economic infrastructure of North Brooklyn and Western Queens, especially the area around the Newtown Creek in Queens and Red Hook in Brooklyn, began in earnest. Connected? Maybe. 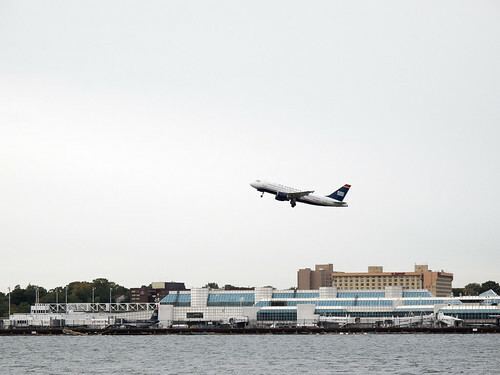 Just outside of the Newtown Pentacle’s north-eastern extant at LaGuardia Airport, beyond the feral Brother Islands and the caustic shores of Rikers Island, is found Flushing Bay. Following the waters as they flow beneath the Whitestone Expressway, one will realize they are upon the Flushing River (or creek, depending on your source, but it’s actually a salt marsh). 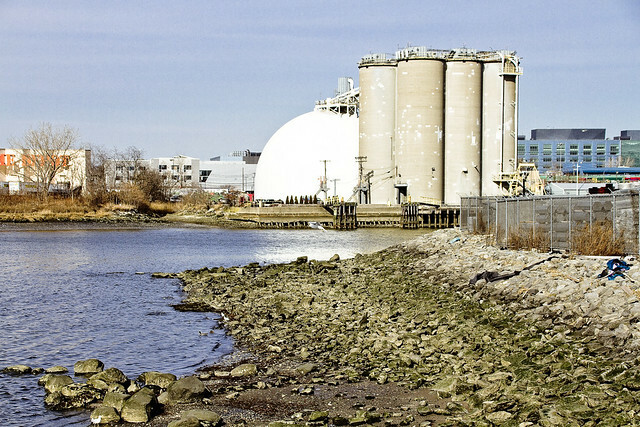 Like the nearby Newtown Creek, Flushing Creek is a heavily industrialized waterway with a long history of epic pollution and municipal abuse. The town of Flushing was first settled in 1645 under charter of the Dutch West India Company and was named after the port of Vlissingen, in the southwestern Netherlands. It is said that the name Vlissingen means “salt meadow,” given as a nod to the tidal waters of Flushing Meadows. As the English version of the name of the Dutch town is “Flushing”, the same English version was used by the town’s English-speaking inhabitants. During his presidency, George Washington arrived to Flushing by ferry across. The first road crossing, a drawbridge at Northern Boulevard, was built in the early 19th century. A vast morass of clinging mud and knife edged grass, Salt Marshes are nevertheless exemplars of biological activity. The stinking mud, bubbling with sulfur and methane, digests organic filth surrendered to it by ocean wave, and provides purchase for tenacious carpets of grasses. This tough vegetable armoring of the shoreline allows more accretion of mud, and in this lilliput of the waves, hordes of multitudinous and loathsomely tentacled carnivores hunt those which are squirming and soft bodied, which form colonies or don shells in self defense. Above the fray, the lords of life and death in this environment truly are the vertebrates, especially those which fly. By the 1850s, a second crossing, Strong’s Causeway was built near the present-day Long Island Expressway, extending Corona Avenue towards Flushing. This crossing was located near the confluence of Horse Brook and Flushing Creek. 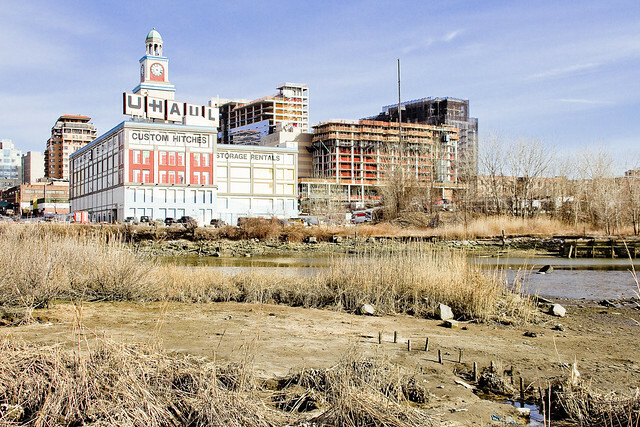 In the mid-19th Century, the growing city of Brooklyn acquired the land around the creek and gave it for use to the Brooklyn Ash Removal Company, which turned the salt marshes into landfill. The pollution was chronicled by F. Scott Fitzgerald in The Great Gatsby, where Nick Carraway observed the “valley of ashes” on his train ride between Manhattan and Long Island. Quiet tides and low rates of erosion allow mile after mile of boggy wetland to feed off the nutrient rich salt water, which becomes increasingly brackish as it mixes with fresh water flowing off and through the upland. 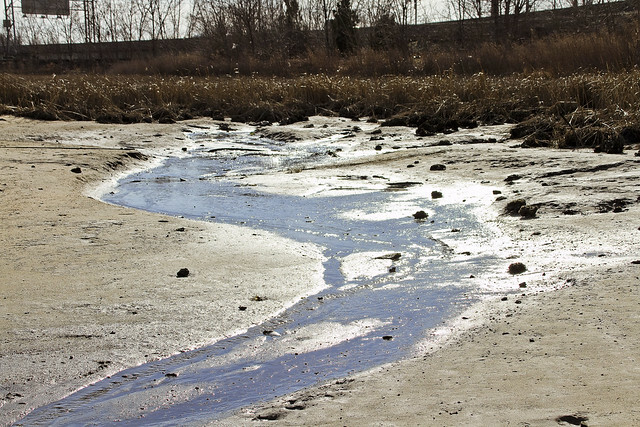 In the case of the modern Flushing Creek, that fresh water is a combination of industrial runoff and cso’s (combined sewer outfall), along with whatever rain water manages to drip off the highways bridging it. In 1936, Robert Moses proposed closing the ash landfill and transforming it into a park through its use as a World’s Fair site. 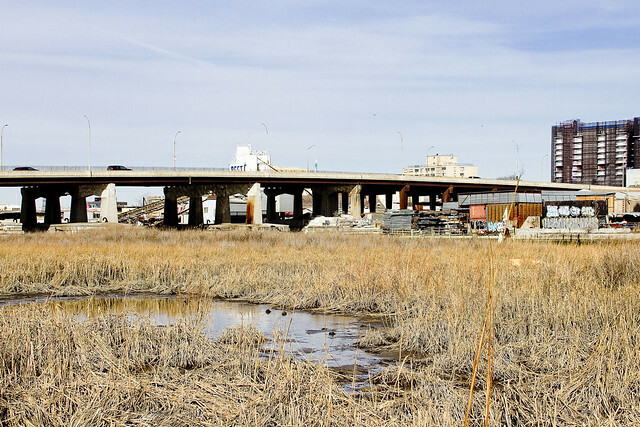 With the exception of the Willets Point triangle, the landfill was leveled, the creek bed was straightened, and the southern part of the creek was deepened to form the Meadow and Willow lakes. At its northern section, a tidal gate bridge was built to keep the East River tide from flooding into the park. By then, Horse Brook was long gone, covered by the future Long Island Expressway. Ireland Creek was also filled in for use as parkland to prevent flooding in the surrounding neighborhoods. Dammed and reduced in size, the creek became navigable only up to Roosevelt Avenue. 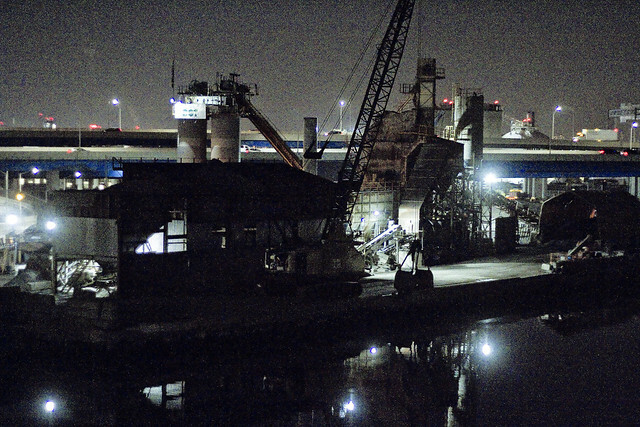 Barges still docked on the river, bringing sand and gravel. At its southern end, the Jamaica subway yard reduced some of the flow coming from the headwaters. Of course, such modern interpretations of what was- until “just yesterday”- considered wasteland, would have been rejected by our progress minded antecedents. An elegant cocktail of petroleum distillates, industrial waste, and municipal sewage were freely combined and dumped directly into the water here for centuries. 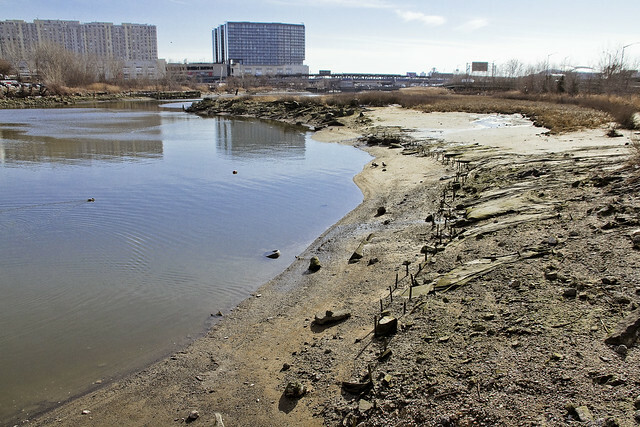 When the highway pilings were driven, the fate of Flushing Creek was sealed for half a century, and the community that had symptomatically formed around and because of the waterway lost access to it. 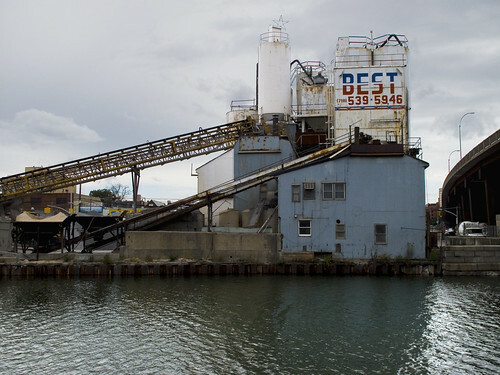 Forgotten-NY, which of course has been everywhere, did a great and in-depth piece on the Flushing Creek (or River, depending)– check it out here. Citi Field is a stadium located in Flushing Meadows–Corona Park in the New York City borough of Queens. 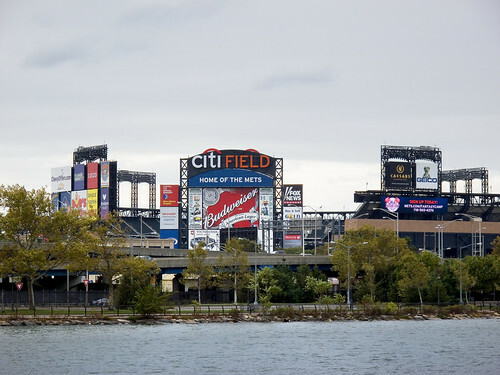 Completed in 2009, it is the home baseball park of Major League Baseball’s New York Mets. Citi Field was built as a replacement for the adjacent Shea Stadium, which was constructed in 1964 next to the site of the 1964-1965 World’s Fair. Citi Field was designed by Populous (formerly HOK Sport), and is named after Citigroup, a financial services company based in New York that purchased the naming rights. The $850 million baseball park is being funded by the sale of New York City municipal bonds which are to be repaid by the Mets plus interest. The payments will offset property taxes for the lifetime of the park.